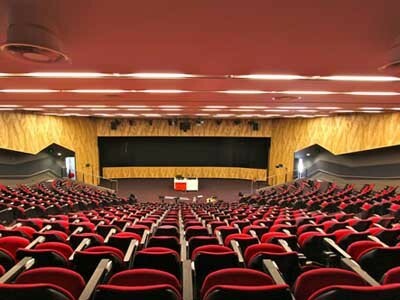 Ultraflex Panelling supplied MDF panels for a recent installation at the auditorium in Macquarie University, NSW. Ultraflex custom manufactured perforated panels with multiple hole sizes to achieve a tree pattern in each panel for the Macquarie Theatre installation. The panels were also compliant with strict acoustic requirements, meeting both functional and aesthetic objectives. About 200 square metres of custom perforated FR MDF with natural timber veneer were used for this application. Ultraflex also supplied sound absorbing fabric wrapped wall panels to meet the acoustic requirements in the auditorium. Concealed split batten fixing was incorporated into the design to allow for LED lighting on the underside of the panels. About 85 square metres of fabric wrapped FR MDF with 32kg/m³ insulation were used in this application. Ultraflex additionally supplied bench seating to enhance the outdoor space around the Macquarie Theatre. A number of timber batten bench seats were supplied to be mounted onto the concrete structures.